Reduce the amount of poles that are in the basement (there seem to be a few of them that dont' have much of a logical layout to them. 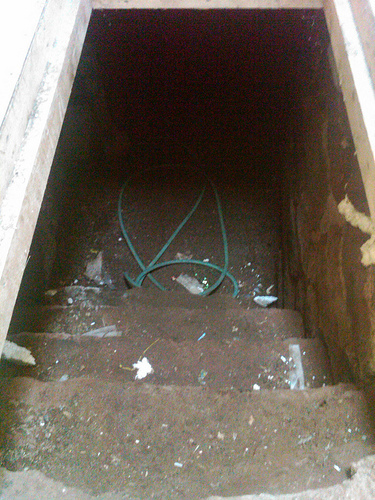 EDIT: Here's a picture of the enterence to the basement in question. I sadly didn't get any pictures of the basement due to the limitation of the camera that I have. You can see the floor is still the dirt floors, with the original stone steps and sandstone blocks. Those blocks are what they used for the foundations, with roughly 6inch diameter wood pillars within the floor area. You have a couple things going on here: 1) The posts. an engineer would have to evaluate to be sure, but it's most likely that you will not be able to remove the posts without providing beams of some sort to span the space between the walls. Their irregular arrangement probably lines up with walls that they are supporting in the first story, which in turn are supporting the floor of the second story. 2) Clearance. Digging deeper to get additional clearance will be challenging, because you will have to leave the footers under the existing foundation in place, and not undermine them. This means you will likely end up with a floor that is a fair amount smaller than the existing space. Also, you will have to support the part of the house that are held up by the posts while they are being relocated/lengthened. In either case, you will need advice from someone knowledgeable in building structure and foundations. Overall, it may be easier/cheaper to raise the level of the house and add additional height to the existing foundation (if it is in good enough shape to take the additional load) than to dig deeper. A contractor that is experienced in this will know how to support the house while it is being raised, and you may be able to include new support beams to eliminate some or all of the posts at the same time. When I drive through places that have a lot of old homes with dirt-floor basements, I also see a lot of billboards for house lifters, crawlspace conversions etc. Some are fullsized billboards and some are just small plastic signs nailed to hydro poles. Call one of those places and ask roughly what to expect per square foot. Sure, it will depend on the house blah blah but they can tell you whether it's closer to 5K or 50K. Just seeing how many such business are advertising in the area will let you know what kind of choices you are likely to have. And if it's a small enough community, the person may know some details about the house and be able to give you a more accurate estimate. I think (based on the fact that people do it) it's cheaper to dig out a basement than to add that square footage onto the house any other way. So that should give you an upper bound, anyway. This is definitely doable, but I would definitely question if it's worthwhile. It's expensive, and depending on the condition of the rest of the house and the area, it may not add the amount of value to the house that it costs to do. Of course, if it's valuable enough to you, and you're not planning on selling soon, you may not care, but this is definitely a consideration, especially if you're borrowing money to pay for the work. It most certainly is not (entirely) a DIY job. You need at the least a structural engineer to evaluate posts and supports. If you dig down, you'll need to replace the existing posts - likely with modern jack posts. If you want to remove some of the posts, then you'll need to run new beams to support the area, which again requires a structural engineer to properly evaluate. If you're going to dig down near existing foundation, you'll probably also need to extend the footings downwards (there are a few techniques for doing this). Are you going to be able to dig down? How deep is the bedrock below the house? How deep is the water table (are you going to just have endless flooding issues)? You can also jack the house up, and pour a new foundation (raising the height of the house), but this may not meet your criteria of reusing the existing sandstone, and has many of the same structural/support problems. If you hire someone in, be sure that you check the references on them and see some other work they did, and that they're insured, etc. This is the sort of job where if they mess up, your entire house can be irreparably damaged (think, crack going through all floors up through a load-bearing wall). The other thing to consider is the condition of the house itself - can it hold up to this kind of a reno? You're going to have temporary supports in place, and you're going to be shifting around the weight loads from the house. The floors and walls WILL move a bit, and may cause damage as a result. If the house is in poor shape, you may end up spending a ton of money/time fixing all sorts of other cracks, jammed doors, broken tiles/hardwood, etc. At the turn of the century, people would regularly skid enormous houses of 2,3 and 4 stories to the next block, or transfer them down hills or pull them up hills with teams of horses. On many occasions, they were successful. It was even common practice to dismantle a house partially by cutting it into two or more pieces, and then move the smaller segments. Much easier for a small team to work with halves. Then they would spend several weeks sistering rafters and stringers, pasting everything back together with plaster of paris and horsehair and replacing all the broken windows. With a few coats of paint, it would look good as new! Invariably those houses would be torn down within 40 years, but that's not the point of the story. The best way to do this would be to draw up precise foundation plans, have 3 or 4 people verify them as accurate (NEVER trust your engineers or architects to catch everything), and then execute the foundation 25 to 50' away from the existing foundation. It has to be in-line with the original foundation. Please tire kick this with house movers first - you can't just call in the sky hooks on a large house, and it will be a lot of work to make sure that your plumbing is ready and in the right place. It's like cutting off your arm and then hooking it back up. People forget things. The second best way is to do it in place. At that point, I'd give up on the project, just because building in place takes so long. But maybe you're better funded than I. Either way, if you do this, see if you can't elevate the house a few feet in the process. Lots of benefits, and a 10' basement is about right. Make sure to address any first floor structural issues before you put the house back down. Insulate. People move houses of up to 1100 sq ft. all the time. People raise houses and redo foundations all the time. The thing to keep in mind is that most marriages may not be structurally sound enough to survive such a project. Just a side note: A guy in jersey built the foundation to do this and the house accidentally burned down after he'd carefully removed all the "historically interesting" components as he prepared to move it. He was able to build an amazingly accurate replica of the original farm house using all new building methods. He went to jail when the same thing happened to him a decade later on a second house. Not the answer you're looking for? Browse other questions tagged repair concrete foundation or ask your own question. How do I quickly address my foundation issues? What is the best way to fill a hole in a concrete basement floor? Can I dig up next to my foundation to add height below my deck for storage? Gap between foundations is a bug entry point? How should I level the concrete foundations for my fence's CMU block pillars? Can I cover these pipes in my basement floor with concrete? Plywood over rigid foam over concrete: will I have moisture issues? How to fix old un-suppported basement wall in house that has had added basement?